LOCATION: Central Virginia — 110 miles southwest of Washington, D.C.; 70 miles west of Richmond; 115 miles northeast of Roanoke. Charlottesville is located in Albemarle County which is bordered by Greene, Orange, Nelson, Fluvanna, Augusta, Buckingham, Rockingham, and Louisa Counties. Nestled between the flatlands of the east coast and the peaks of the Blue Ridge Mountains - just 2+ hours to our Nation’s Capital and 3 hours to the Atlantic Ocean, we are just a short drive to everything! 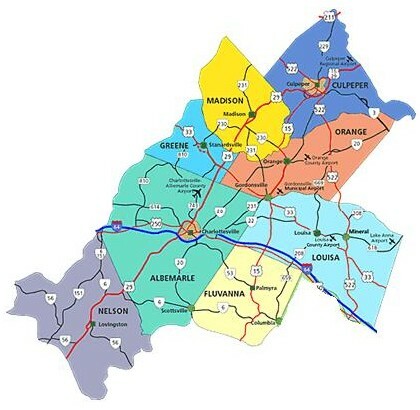 I am a member of the Charlottesville Area Association of Realtors and the areas that I cover are the City of Charlottesville and the Counties of Albemarle, Greene, Louisa, Fluvanna, Nelson and parts of Madison and Orange. CLIMATE: Charlottesville has one of the most distinctive and pleasant climates in the country. The weather is influenced significantly by the Blue Ridge Mountains, approximately fifteen miles to the west, and the Chesapeake Bay and Atlantic Ocean to the east. Both act in concert to modify extremes, giving the area and a surrounding narrow strip along the western Piedmont of Virginia and North Carolina one of the most amenable climates in North America. Summers are warm, with daytime maximum temperatures averaging in the mid to upper 80's, and lows in the 60's. Maximum persisting dew-points, which are a good measure of the expected levels of discomfort, are in the mid 70's, and are in fact lower than they are in either Chicago or Minneapolis. Relative humidity in July along the western Piedmont strip is the lowest for the entire East Coast south of New England. The area does experience a few days over 100 degrees, but temperatures rarely reach 90 in the middle of summer. Winter high temperatures average in the upper 40's, with lows in the upper 20's. This is considerably warmer than areas immediately to the west at the same elevation. The severity of the Arctic outbreaks is substantially mitigated by the Blue Ridge, because of the down-slope warming and increased sunshine. Record low temperatures immediately to the west of the Blue Ridge are nearly 15 degrees colder than they are in Charlottesville. The mercury can fall below zero at times but long cold spells are rare. The area averages 44 inches of rainfall annually from moisture originating from the Gulf of Mexico or the Atlantic Ocean. Summer average rainfall of 14 inches falls primarily during scattered afternoon and evening thunderstorms which are quite frequent (about 40 per year). However, they are usually quite weak by U.S. standards, as they are influenced by downward motion as they transit the Blue Ridge. The immediate surrounding area averages 24 inches of snow per year, but residence time on the ground is quite short, with an average of only between ten and twenty days per year with more than an inch of snow reported on the ground. Snowfalls in the nearby mountains can be excessive, and colder temperatures assure a much more continuous snow-pack. Using combinations of both natural and man-made "snow," two highly successful ski resorts are in operation within 45 minutes drive. Air Service: The Charlottesville-Albemarle Airport (CHO) offers commercial and general avia­tion services to the greater Charlottesville-Albemarle County region. Sixty (60) scheduled airline flights are offered to and from Atlanta, GA, Charlotte NC, Pittsburgh PA, Washington - Dulles, New York LaGuardia, Philadelphia, PA, and Cincinnati OH. CHO is served by Delta Connection with jet service to its primary hubs in Atlanta and Cincinnati, United Express with jet service to Washington-Dulles International Airport, and US Airways Express. CHO provides a modern terminal facility with a number of customer amenities including on-site rental cars (Avis, Hertz, and National), taxicab and shuttle van ground transportation services, and a food/gift conces­sion. General aviation facilities include an executive terminal offering full aircraft services, flight instruction, charter, and aircraft maintenance. CHO is located 8 miles north of the City of Charlottesville in Albemarle County, 1 mile west of Route 29 on Airport Road. To learn more about CHO, visit www.gocho.com. Highways: Interstate 64 runs east and west inter­secting with I-95 in Richmond, l-85 in Petersburg and I-81 in Staunton. Complemented by Route 29 North/South and Route 250 East/West, this network links Charlottesville and Albemarle County to all major east coast markets. Public Transportation: Along with local airline and railroad service, Charlottesville has a complete transit system. The Charlottesville Transit System (CTS) operates six days a week and traverses the whole city and parts of the county. All buses contain wheelchair lifts. Reduced fares are available for elderly and disabled citizens. Children under five ride for free, while CTS does charge for all other per­sons. CTS also provides a free Trolley Bus with service from Downtown Charlottesville to the Corner at UVA. For more information, call 434-296-RIDE. Railway: The main line of the Norfolk Southern from Washington, D.C. to Atlanta, Georgia, and New Orleans, Louisiana, runs through Albemarle County with a passenger and freight station at Charlottesville. For passen­ger service, schedules and fares can be obtained through the Amtrak Reservations Website at: reservations.amtrak.com or by calling 1-800-USA-RAIL. CSX provides freight service from Charlottesville. For information call CSX 877-744-7279 or on-line at: www.shipcsx.com. Trucking: 16 interstate carriers service the area, four hav­ing county terminals, UPS, FedEx, Swift, and Roadway Express.